PIRIT Heated Hose | OhGizmo! I can’t say I’ve ever had the need to use a hose when the temperature outside was below the freezing mark, but I’m sure someone, somewhere has. Otherwise this heated hose from PIRIT probably wouldn’t exist. 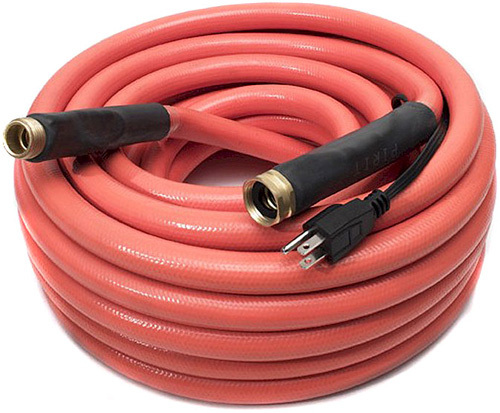 As you can see in the photo, it looks like your garden-variety water hose, but with the addition of a grounded plug that’s connected to a copper wire heating element that runs its entire length. When plugged in, a built-in thermostat activates the heating element when the ambient temperature outside the hose is below 95° F, and automatically shuts it off when the temperature rises above 105° F. The heating element can also be used to thaw the hose if it’s filled with ice, or even just as a radiant heat source to keep a greenhouse warm or to melt snow. All-in-all I guess it’s not a bad idea, though 50 feet of it will set you back $189.